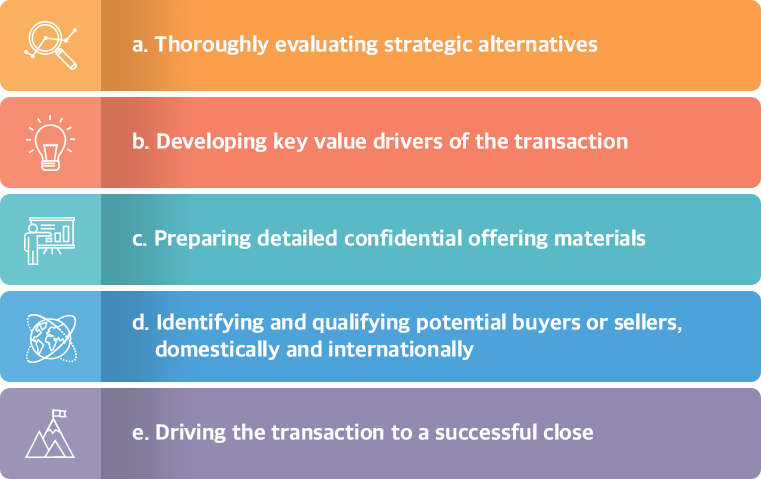 We represent middle market business owners, private equity groups, and private as well as public corporations in both sell-side and buy-side Mergers & Acquisitions engagements from early stage strategic planning to final transaction closing. Our investment bankers have successfully placed senior secured and unsecured notes, mezzanine securities, high-yield notes, and preferred and common equity. Our investment bankers skillfully guide companies step by step through the entire process of securing access to private institutional capital. With our in-depth knowledge of institutional investors and their specific investment parameters, our team effectively manages the entire placement process from initial due diligence to negotiation of terms and covenants, coordination of legal documentation, and closing. We advise our clients the most optimal pricing and terms to meet their strategic objectives. We will support, stimulate, and challenge our clients’ point of view and enhance their strategic decision making process. Through the use of modeling tools, strategic planning analysis, business valuations, and financial capacity analysis, to name a few, we help establish the most appropriate growth strategy.